CHP works with students all the time who are experimenting with radiation. Some of you may know of Taylor Wilson, who was 13 year olds when we worked with him as he built an accelerator in his basement and sustained a fusion reaction! 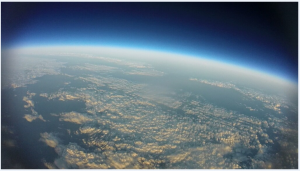 This time we sent a dosimeter up on a weather balloon to 67,000 ft to see what was up there. A great view for sure!